Fickle Feline: BlogHer, Here I Come! I am a little (lot) shocked as I sit here and type this...I WON! I won the Mabel's Labels BlogHer Contest! I really didn't think I had a chance, but I guess sometimes miracles happen. Or maybe I just have really wonderful friends who helped me rock the vote. An example of social media at its finest, perhaps? Thank you to everyone who voted for me - you have no idea what this trip means to me. Or maybe you do, and that's why you cast a ballot for Fickle Feline. The picture above was taken in October 2007 in Chicago. I was in town for the Direct Marketing Association Convention, and in the very early days of my pregnancy with Cameron. Scott was dying to get some Chicago style pizza, so we went to Giordano's and waited for a ridiculous amount of time just to get seated. Then we waited some more and I almost passed out because I was so hungry. The kind people at the table next to us gave me a piece of their pizza because they saw how pale I was getting! Chicago may be the windy city, but it is also one of the friendliest cities I have ever visited. I can't wait to meet many of the bloghers I've been reading for the past five years, and to get inspired to do more with my blog. If you're going, let me know and we'll meet up! Chi-Town here I come! Hey, Katrina, guess you're not so "little" after all, eh? 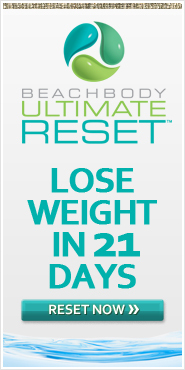 Congratulations on being the big winner!! I'll be looking forward to reading your dispatches from Chicago this summer. Deb - Mom of 3 Girls 1:29 p.m. Thanks ladies - I am VERY surprised! I hope we all get to meet at BlogHer one way or another. Through My Lens 1:41 p.m.
Oh man! I'm jealous! I love me some Chicago AND some pizza with CHEESE! No fair! andrea from the fishbowl 2:02 p.m. I just reread your original entry. It was great - you very much deserve to go! Good luck at BlogHer and have fun! Renée aka Mekhismom 2:06 p.m.
Congratulations! 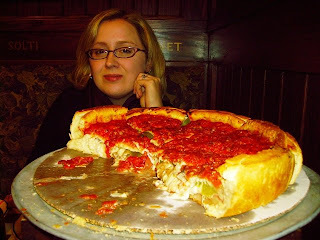 That pizza looks yummy, I am certainly going to have to try it when I am in Chi-Town. See you at BlogHer! Congratulations!! I am really glad if it wasn't me that it was you!!!! 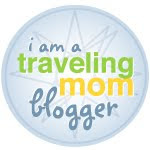 I hope to get there another way and will see you at Blogher Mama! You spoke from your heart, and it really struck people. You should write more. Yay! Congrats!! Tears in my eyes as I write this. I couldn't be more excited or proud. You rocked it and totally deserve it. Congrats and have a great time! Congratulations on your win, Katrina. Hope you have a great trip!! Keep on blogging from the heart. Kat, I am so very happy for you. From what I have been reading of your story, you truly deserve this! What a great treat. Congratulations!!! Thank you so much everyone! And yes, I will be writing a post on RaptorBlog as promised! Kat, for what it's worth, I, as a typical "guys guy" - cannot stop reading your blogs! (according to the comments I see posted this is clearly a new demographic for you!) ;) If I read the first line, I read it 'til the end. This is new. Trust me. You really are a gifted writer. Your style, clever insight, wit and charisma are undeniable... and it seems I am not the only one of this opinion. Kim @ What's That Smell? 2:11 p.m.
YAY KAT! I'm so excited for you! What a huge moment for you and your work. Congrats - that's so awesome that you won. I've been quietly reading your blog for the past few months and enjoy reading about your life and your kids. You make me want to write letters to my girls like you have.